← On self-worth and Facebook likes. Eight people, one dog. 5 bottles of wine, 24 beers, two cheeses and an apple. A picnic in the park, Ralph Lauren tapestry, perfect spring afternoon, surrounded by budding flowers, bare trees and the George Washington Bridge over the Hudson, a quiet reminder that we were still in the city, despite the eerie calm and open space around us, the only ones on that lawn, soaking in the sun after such a long winter. I decided to put aside the standard cry for PLDmaking activities this weekend and take the weekend to relax in my neighborhood, wandering between my apartment and 11 blocks down with my lovely friend M, our weekend routine of gym, then cleaning, then rewatching the most recent How I Met Your Mother. We did take a few hours on Saturday to round up the troops and put together a celebratory picnic in the park, an impromptu feast pulled from M’s fridge. 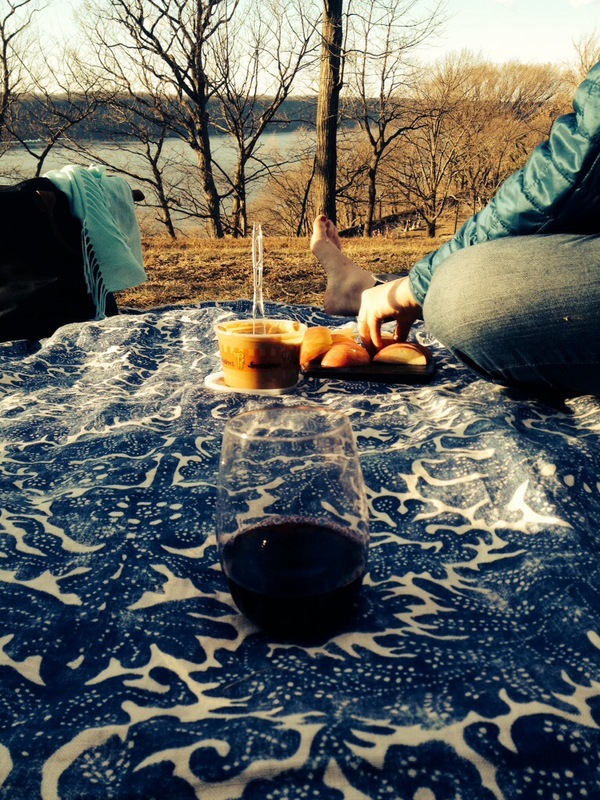 Though never ones in need of an excuse to picnic and drink, we wanted a few minutes to enjoy our surroundings, toasting our plastic glasses of screw-top vino in celebration of my first year living alone in the Heights. Anniversaries come and go, but the one I celebrated this weekend was especially noteworthy, seeing as I was never supposed to be in Washington Heights for more than a year. I could sit and list the wonderful characteristics about my neighborhood, like the music that swells from 11 a.m. on Saturday till 11 p.m. on Sunday, a constantly cheery soundtrack to a sunny, almost-spring weekend. Or Fort Tryon, the hidden gem uptown, all the beauty of Central Park with none of the crowds, a view of the GWB and the Cloisters instead of skyscrapers. Or even the wonderful pocket of restaurants on 181st, everything from pasta to paella, all made with love. I could list these and keep going: the people, the places, the culture, the crazy. No, I think instead I’ll keep some of the memories from this weekend to myself, a personal reflection on the impact of choices and changes in just 365 days. And who knows if I’ll be celebrating again next year, or what I’ll be celebrating at this time next year. If it’s half as wonderful as a picnic in the park with the people (and dog) I love, that have held my hand, head and heart up any time I’ve asked and even when I haven’t, enveloped in the fuzzy warmth of Rioja in plastic cups, I’ll be completely satisfied.